I have zero intentions of burning any bridges. They did nothing wrong I just cannot commit to this at this time due to unforseen circumstances. Well as most of you know I went to Knight Transportation after a lack of trainers at a different company. The folks at knight have been great. I had to come home due to a family emergency and cannot leave due to that same issue. I would like to thank everyone here for their guidance, thoughts, encouragement, and great advice. I'm sure this is the end of a dream but my family comes first. I cannot do the OTR thing but will continue to follow my dream and drive even if it's not OTR. Some people say that when one door closes another opens and I can say I hope it opens fast. I bid you all well wishes and hopefully one day I'll be able to live this dream. Thanks Brett and old school. My morning started about 2 am as I awoke and couldn't sleep so I played there tossing and turning until it was time to head to the terminal. Got there about pep and sat with the trainer waiting for a load. We finally leave a little after noon to pick up an empty then off to pick up a load of copy paper headed to the Chicago area. In true rookie form we have the hiccup of truck issues. About 30 minutes from the pick up the a.c. acts up. Its about 90 in the truck but we roll the Windows down and go on in. As we pick up the load and head north the a.c. once again craps out. So we are going to grin and bear it abd head to Memphis to the shop in the morning. I'm hoping but I'm sure it won't be the only hiccup for this 28 days of training. I'm up for 28 days of training. Looking forward to getting some real schooling. Trainer seems to be a really cool guy from our talk today. Can't wait to get this going. I'm finally getting a trainer. Seems like forever since I've started and tomorrow morning it all happens. I am to arrive between 930 and 10 in the morning to meet with my trainer and we will be getting this party started. As excited as I am it's just how nervous I am all at the same time. I had the pleasure of speaking with him today for a while and the lessons already started. I will post as much as possible. Wish me luck or my trainer hell wish us both luck I'm sure we will need it. I haven't been in a truck since the end of April I'm sure I am rusty with the very little I learned in school. Knight just burst my bubble... Now what? You should if there are no other problems. Sorry to hear this. You may want to contact the recruiter and get clarification. I just attended orientation and the paid for my hotel. Also the 4 weeks will not be spent in the hotel. Some is classroom and other parts are on the truck. At least that's how I understand it to be. If.it's any help while in school the trucks we had were about 6-7 years old. I'm 6'1 320 and had tons of room. Ask and you shall receive. I leave out Monday. Can't wait to get this process going. Ok so I've been home waiting on a trainer since Thursday. On the average what is the normal if there is such a thing. I don't want to seem impatient but I am bored as hell sitting around the house. Sometimes that grass truly is greener. But why? Is it all the crap they are fertilizing it with? When I first started down this road I wanted to.go.to prime then knight then mc elroy. Fact is I thought I wanted them all. I was luck I went through a private school which was paid for via a grant. Look into grants they are out there for schooling. After school I was sold on mc elroy I applied and was rejected. I took that hit like Mike Tyson being hit by a toddler. I kept on going knowing that someone out there would pick me up. Since then I've gotten 11 prehire letters made the choice to go to a carrier went through orientation and ended up sitting because of lack of trainers. I was bummed but never let it slow me down from getting where I wanted to be and that's behind the wheel of a semi. While sitting and playing the wait and see game for a trainer I learned it would be a few weeks. Well...I'm not rich and needed to make money. I applied to 4 more companies and all 4 were willing to take me. I know my situation is different as I hold a class a but the point I am making here is do not give up. I have a motto and that's never give up and never give in. Part of that holds true but I have found there are time you may have to give in a little but never give up. If you do then they win. My number one choice rejected me but I now am a proud employee of knight. I will drive just as hard for them as I would anyone. So the moral is if you want it bad enough you will fine a way to make it happen. Brett had a great site here and the company sponsored training section here is worth it's weight in gold to someone like you search it high and low call them and ask all the questions you need answered. Research a health and wellness program called rolling strong. 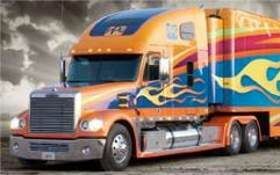 Its designed by a truck driver. I can tell you what I know which isn't much as I've just completed orientation with knight. Pay is 400 a week the training isn't free you will be paying.t back in small amounts from what I understand from those in orientation who will need schooling. The pay does not come the week you're in orientation. It may come the following week. As for transportation there yes they will provide you a bus ticket and I'm fairly certain they will have either a knight shuttle or one from the hotel pick you up. The orientation I attended was very condensed as they are in the process of changing how it's done. Everyon at the terminal I'll be assigned to was first class and friendly even the veteran drivers. I have a copy of the pay scale if I can figure it out I'll let you know as I haven't looked at it as I'm more worried about getting my foot in the door and making a good impression. I just finished orientation with knight today. I was told that I could have an inverter provided it would operate from a 12v lighter plug. I have a cpap machine and will need the inverter to power my machine. I have a 400 watt one which should be enough. As for cooking 12v is going.to be my way to go or maybe a small propane camp stove to use outside of the truck. If it is allowed. Of course I will be checking first. As for food storage I will be using a regular cooler until I'm able to get a 12v cooler but those are small obstacles in the grand scheme of things. I have the can do it type of attitude and where there is a will there is a way mentality. Completed orientation today with knight in Gulfport. Met a lot of really nice folks over these three days. I'm looking forward to hitting the road with a trainer and getting this show started. Old school I'd really like to chat with you via private message if you have time I have a few questions that I'm sure you can answer for me as these were not gone over in orientation.